There are few places in Queens that I like birding in winter more than Baisley Pond Park. 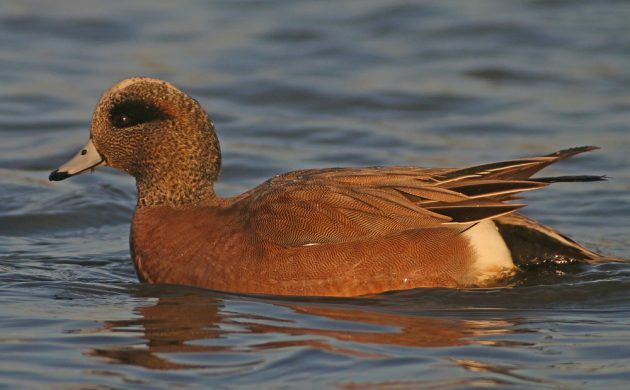 When I go to Baisley, which is located in the neighborhood of South Jamaica, I know that I am, at the least, going to see at least ten species of waterfowl, a variety of gulls, some sparrows and other songbirds, and perhaps a raptor or two. 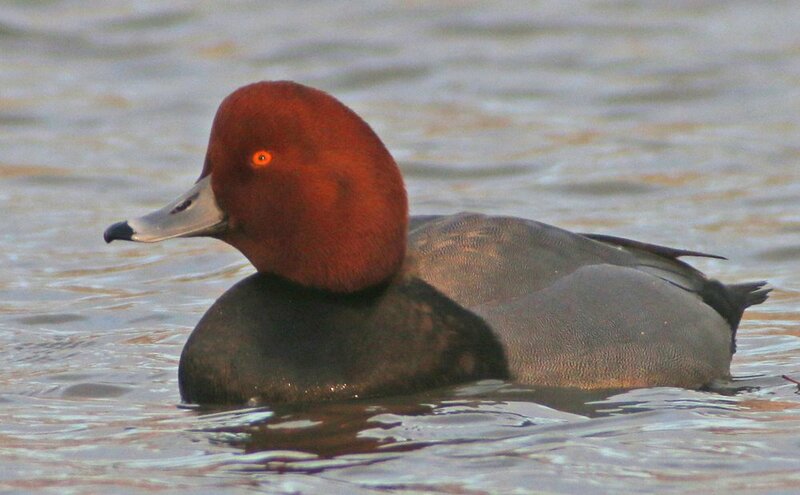 When the pond is mostly frozen I can count on the waterfowl being concentrated and if the sun is out I almost always have excellent opportunities for some digiscoping. Baisley Pond Park is the place to find Ring-necked Ducks and Redheads in New York City, it usually hosts the largest flock of wintering American Coots, and the Canada Goose and Ring-billed Gull flocks sometimes hide a rarity among them. 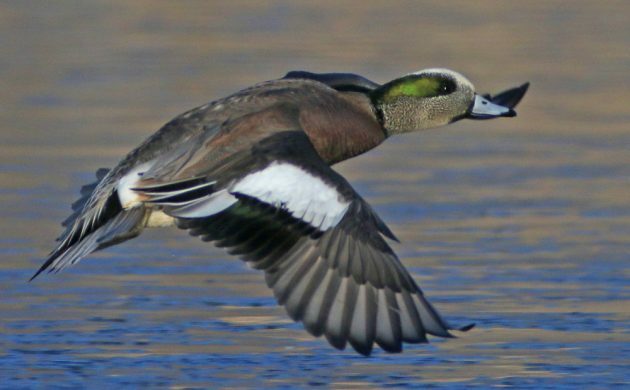 As for dabbling ducks, it is easy to see American Wigeon, Mallards, American Black Ducks, and Gadwall on every visit and sometimes a teal, a pintail, or a Wood Duck will be there too. On Sunday morning I was at Baisley Pond shortly after the sun came up. 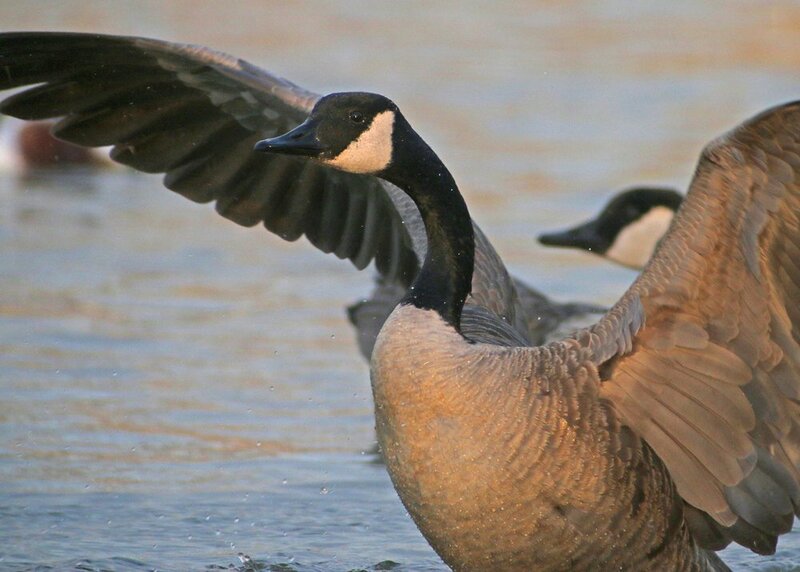 I was early enough that the large flocks of Canada Geese that tend to roost there hadn’t departed the pond yet so I spent a while searching through them hoping to find a Cackling Goose (or something better) with no luck. We don’t have enough photos of Canada Geese on this blog. Lacking rare geese I turned to the ducks. I just watched for awhile as the sun wasn’t high enough to be hitting the part of the pond where the ducks were. It was interesting watching the American Coots diving down to the bottom of the pond and bringing vegetation up to munch on. Even more fun was watching the dabbling ducks trying to take away the coots’ snacks. The entire time I as at the pond I watched similar interactions take place and never saw a dabbling duck get its own food while I was there. They only stole from the coots. 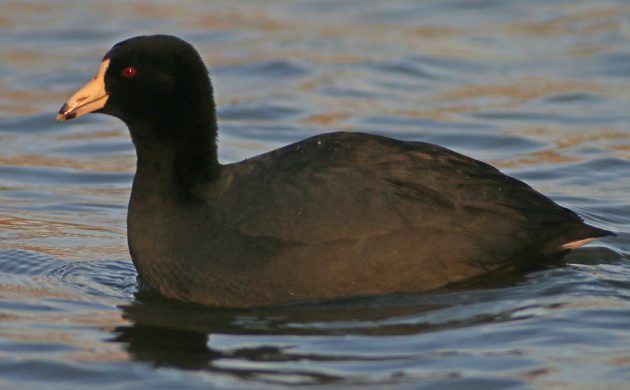 Coots always seem like they are giving you the stink eye. Now you know why. 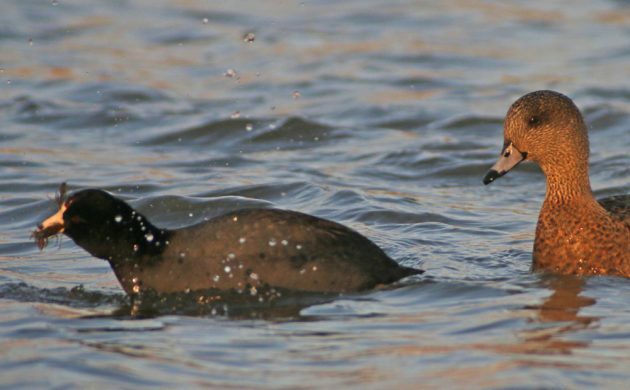 Here a female American Wigeon chases down a coot and its bounty. There are at least seven dabbling ducks in this photo, all attendant on a single coot. I almost felt bad for the butterball. When there are so many species in front of you it can be difficult to decide what to digiscope. So I just kept firing away at whatever looked nicest at the moment. 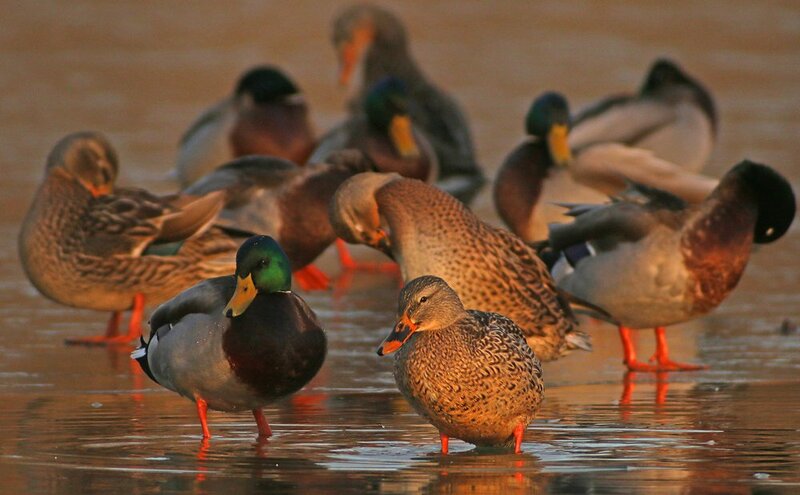 A whole bunch of Mallards preening after a long night sleeping on ice? Why not get a picture? A female Ruddy Duck swimming close-to-shore? Click-click-click. 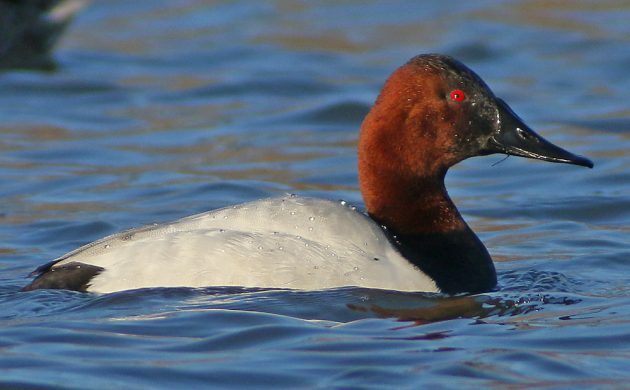 And I can never resist the allure of photographing a close Canvasback. I was particularly pleased that the water droplets showed, even on the white! Who can resist the allure of a ravishing Redhead? Damned gingers. Even hybrids got attention from me. 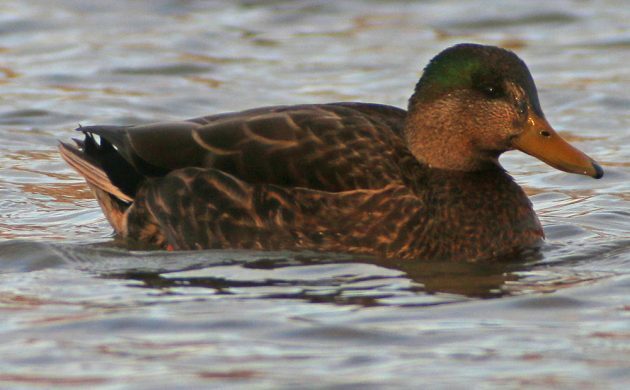 Mallard X American Black Duck is probably the most boring hybrid in existence. Whenever birds flew past I did my best to capture the action. 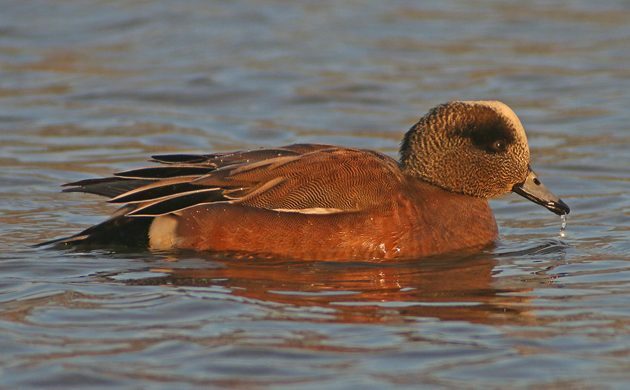 I think this wigeon worked out alright. 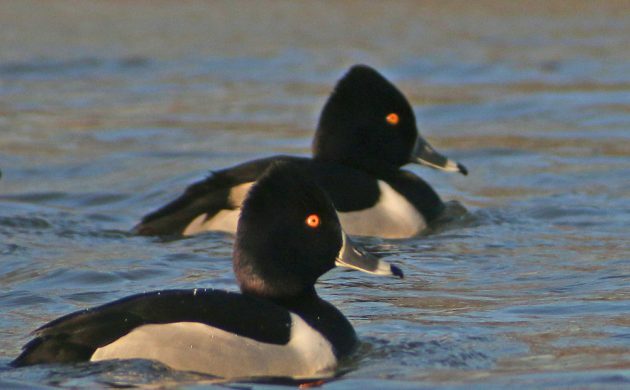 The Ring-necked Ducks were the least cooperative birds on the pond. This is the best I could get. I can’t wait for my next visit to Baisley. 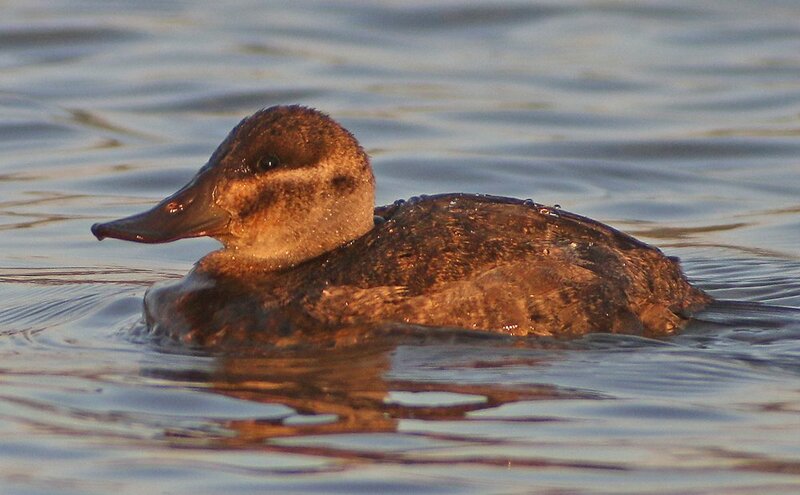 Here’s hoping I get lots more digiscoping, lots more flight shots, and at least one rarity!